Vanillaware's tribute to classic side-scrolling action role-playing games has garnered a lot of attention over the past few years for its exaggerated, overly-sexualized character designs. An hour into playing the actual game, I stopped noticing. Those designs don't go away, of course. There isn't a piece of equipment in the game capable of covering up the comically massive thighs of my beloved Amazon warrior. The Dwarf never covers his rippling pecs, and the Sorceress' questionable wardrobe choices are maintained throughout the course of this epic adventure. It's the context that changes the perspective. Presented in a short trailer or a series of screenshots, these fantastic characters certainly draw the eye and invite criticism. Once I spent some time in designer George Kamitani's highly-stylized fantasy world, these otherwise freakish figures fell into place. They became the subjects in a fabulous interactive tableau, where every screenshot is a work of art (minus the user interface and damage numbers, of course). The gorgeous visuals obscure a desperate world battling a desperate situation. The eponymous Dragon's Crown is an all-powerful magical artifact, sought after by dark forces wishing to use it for sinister purposes. Players are tasked with securing the artifact before that happens, saving the world in the process. In the grand tradition of games like Golden Axe and the Dungeon & Dragons arcade games from Capcom (which George Kamitani worked on), the plot is a flimsy excuse for players to join together and hack, slash and cast their way to greatness. The inspiration taken from those older games is unmistakable — it's almost distracting, really. From the moment I mounted my first attack panther, I was playing Golden Axe Evolution, a theoretical game that might have happened if the horrible Golden Axe: Beast Rider hadn't. 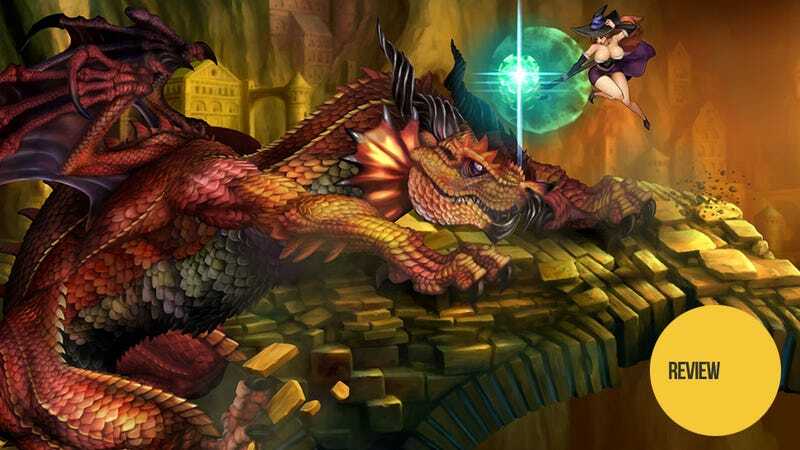 Dragon's Crown goes much deeper than the arcade battlers of yore. Each of the game's nine main dungeons ends with the accumulation of experience points and the distribution of treasures, which for some annoying reason have to be identified before they can be used. Experience levels bring skill points, used to gain new powers and abilities in both general and class-specific categories. This allows players to craft specialized builds for each of the game's six characters, tailoring them to their preferred play style. There's a level of depth to the game that's, for the most part, purely optional. If a player wants to simply grab a Fighter — the game's least nuanced character — and hack away, all they have to worry about keeping their equipment upgraded and repaired and picking up the odd pile of bones — the remains of dead adventurers strewn about dungeon floors, which can be resurrected to act as AI companions in single-player mode. But single-player is not where the real joy of Dragon's Crown lies. Once the initial set of dungeons is cleared (which took about seven hours, in my case), the game opens up online play, where friends can gather and strangers can be auto-matched into parties to take on the game's advanced challenges. It's in the midst of the fluid madness of multiplayer combat where Dragon's Crown comes truly shines. Four heroes cooperating to take down a difficult boss, the more skilled carrying the less through to the very end. Four right analog stick-controlled cursors on the screen, unlocking doors, activating runes or trying to poke at the portrait of an NPC during a dungeon cutscene. A single player with knowledge of the game's spectacular boss fights somehow — without the benefit of voice chat — getting their compatriots to mass behind them as they pick up the shield to deflect the red dragon's devastating fire breath. It's about four sets of hands greedily grabbing for ingredients during the between-dungeon cooking mini-game. Honestly, before multiplayer opened up, I was getting bored with Dragon's Crown. The scenery was pretty enough, but mashing on the square and circle buttons of my Dualshock as my borderline-moronic NPC allies flailed about was getting old. Now that I can play online — even taking into account that the second half of the game is the same nine dungeons enhanced with branching paths — I can easily see myself continuing past normal mode into what lies beyond, maybe even reaching the fabled level 99 cap with my Elf one far-off day. I played Dragon's Crown on both the PlayStation 3 and the PS Vita, thanks to the ability to upload and download save games to and from both systems. While the Vita suffers from noticeable slowdown during busy battles, the convenience of being able to advance my game no matter how long I was in the restroom is worth some stutter. If you're serious about playing, getting both wouldn't be a bad idea. It's honestly the most action my Vita's seen since Persona 4 Golden came out. When I look at Dragon's Crown now, I see a worthy successor to the games that first brought arcade action into the realm of role-playing. I see countless hours filled with chaotic dungeon-crawling, overcoming repetition through an endless parade of like-minded adventurers. I see a beautiful game that's definitely worth exploring further. And yes, I see the exaggerated characters, but I don't mind them so much. If you do, best move along.